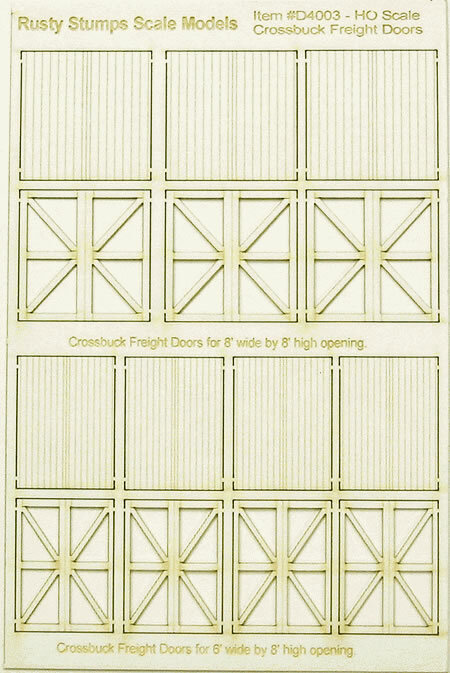 These Freight Doors will look great on the scratch-built or kit-bashed warehouse, freight depot, or industrial building. The sheet contains three (3) crossbuck freight doors for an 8' x 8' opening and four (4) doors for a 6' x 8' opening. The doors are a two-part assembly - laminated together to give a nice 3-dimensional detail. If desired, the door assemblies may be split down the center score line to either make single doors or to place doors in an open position. To give a two-tone paint effect, paint each layer before laminated together; it may be helpful to paint the pieces while still attached to the carrier sheet. After the paint has dried, carefully cut the pieces from the carrier sheet, remove the protective backing from the back of the crossbuck frame, align it with the front of the scribed piece, and laminate the two together. If the doors will be in the closed position, there is no need to remove the protective backing sheet from the back side of the scribed layer. If doors are to placed in an open position, to create the crossbuck detail on both sides, make up two single-sided doors and laminate the two assemblies back-to-back using the self-adhesive on the backside of the scribed layer. Double Entry Freight Door 3 8'-0" 8'-0" 1.1034" 1.1034"
Double Entry Freight Door 4 6'-0" 8'-0" 0.8276" 1.1034"